Sometimes when you’re traveling, you just have to go in the direction the horse wants to go. When we were on our recent trip to Croatia, we’d planned to take a side trip to Venice. The only other time we’d been in the “City of Love”, we’d been treated to two days of non-stop rain. After several frustrating hours searching Google Flights and Rome2Rio, we reached the conclusion that cheap flights across the Adriatic came to an abrupt halt in mid-September. Since we were already scheduled to fly into Zagreb from Frankfurt, we opted instead to double back two hours by train for three days in Ljubljana, the capital of the Slovenia. Through AirBnB, we booked the top floor of a heritage building apartment in the old town, right on the Ljubljanica River. We were looking forward to meeting our host, Sara, and getting to know a bit more about the city. As the date of our arrival grew near, Sara decided to go on a round-the-world sojourn, and told us we’d have the entire place to ourselves. A friend would meet us there and let us in. By then we knew that the train connection in Zagreb would have us arriving in Ljubljana around midnight, so we hoped Sara’s friend was a good one. We checked the walking route from the train station to the apartment – looked at a couple Google street views – and convinced ourselves it would be safe enough, even at that late hour. We first crossed the Dragon Bridge after midnight, but returned late the next afternoon. Likely the most dangerous thing we did was to walk down 20 minutes of cobblestone streets with our suitcases mimicking rolling thunder. 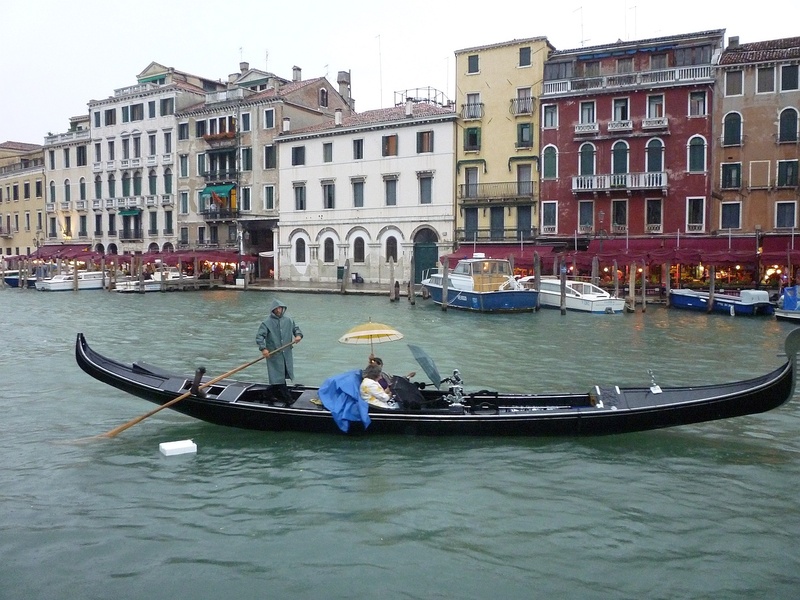 Such unneighbourly behaviour might soon be banned in Venice – and I completely understand. (Does anyone make a suitcase with soft rubber tires?) Fortunately, no one pelted us with tomatoes, Sara’s friend was right on time, and we crashed into a comfortable loft bed in our old town apartment. Our apartment building from across the River, with Ljubljanski grad above. Jet-lagged from our overnight flight to Europe, it was 11am before we awoke to a sunny September morning and a view of the hilltop Ljubljana Castle (Ljubljanski grad) a few blocks distant. We decided to climb the hill first thing, get an overview of the city, and perhaps spend a couple of hours in the castle. Instead, we spent the entire afternoon: going on a castle tour, visiting the small museum, and eating at a tasty yet reasonable heritage restaurant. We learned that the area has been settled for thousands of years. Six thousand years ago there were stone-age farmers living in houses on piles in the marshes. The oldest wooden wheel ever discovered was found in this area. Exactly 2000 years before our visit, the Romans founded the city of Emona on the site of present-day Ljubljana. And we also learned that Slovenians love their ice cream – which is very good, and quite similar in style to the Italian gelato. We had our first of many in the castle. 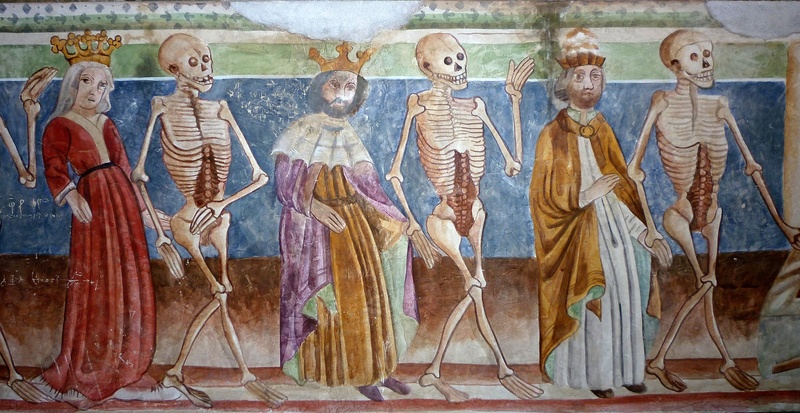 A mural in the museum in Ljubljana Castle reminds us that, peasant or noble, we are all equal in death. For the rest of the day, and the following morning, we simply wandered around the pedestrian streets along both sides of the river. The river is criss-crossed with foot bridges in the old town, and at the edge of those limits is Zmajski most , the famous Dragon Bridge. The town is a peaceful and attractive place to while away a day. 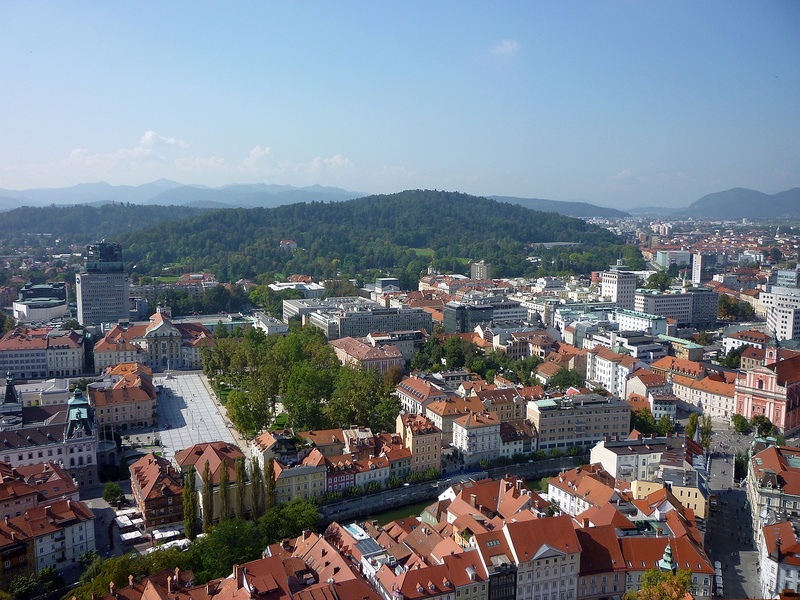 With a population of less than 300,000, Ljubljana must be one of the smallest capital cities in Europe. It’s clean and comfortable, and offers many outdoor cafes and restaurants. And ice cream on every corner. On the riverside walk right outside our apartment was a wonderful cart offering homemade flavours such as black sesame, and pink grapefruit with fresh basil. I went back for seconds. 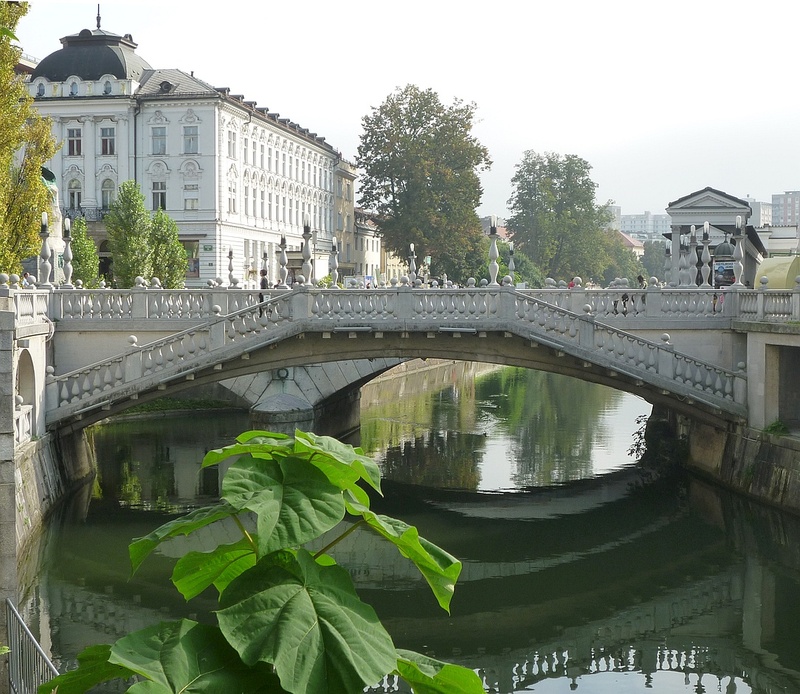 The Lower Bridge, designed in the Venetian style by Giovanni Picco, became the distinctive Triple Bridge when Ljubljana’s best-known architect Jože Plečnik added the two side bridges in 1929. For the last day and a half of our stay, we elected to take a couple of day tours with a local company called Roundabout. 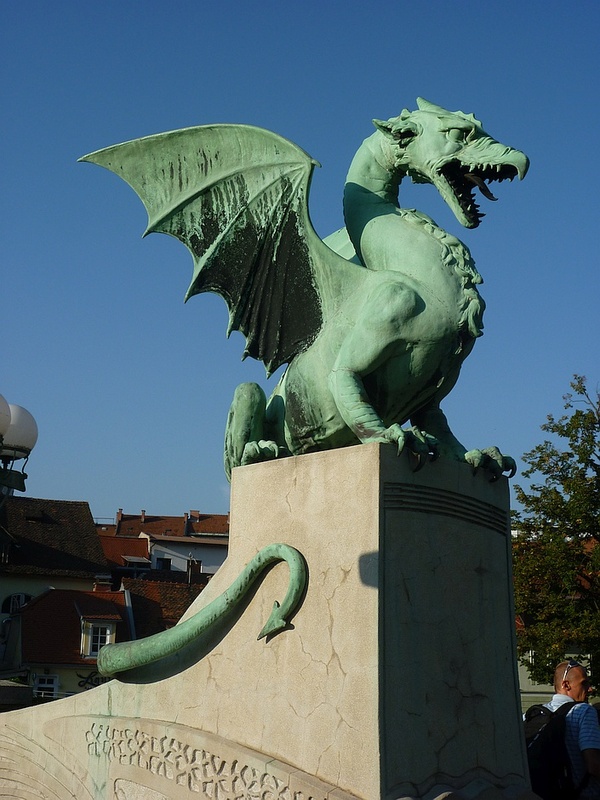 The company offers several half and full-day tours out of Ljubljana, and is well regarded. Our first one was a long “half-day” tour which allowed us visit the famous Postojna Cave, where an electric train carried us several kilometres into the mountain. Nearby is Predjama Castle, where a 15th-century “robber baron” weathered the Holy Roman Emperor’s military siege for over a year by means of secret caves through the mountain behind the castle. 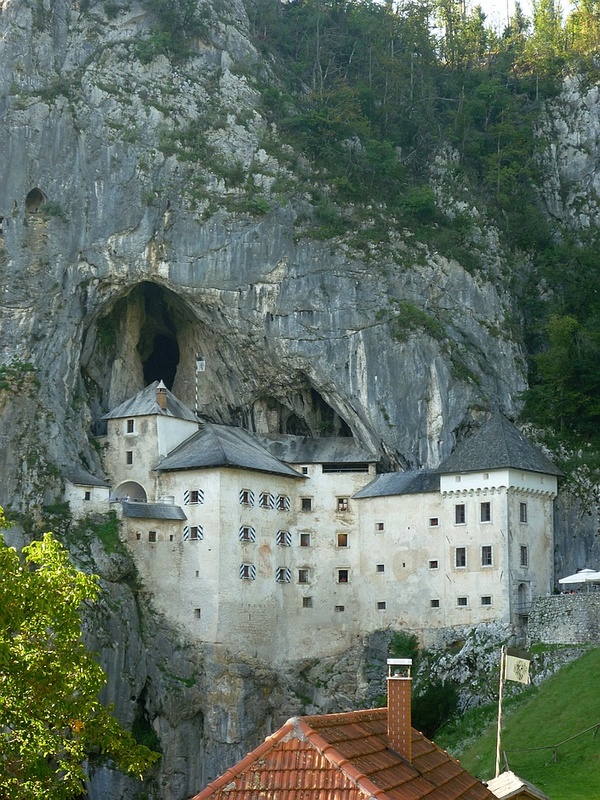 Predjama Castle is built into a cliffside cave. The baron met his end with a cannonball fired into the toilet on the far left. We especially liked that each tour was limited to four people plus a guide. This allowed us a lot of flexibility on the various options along the way. 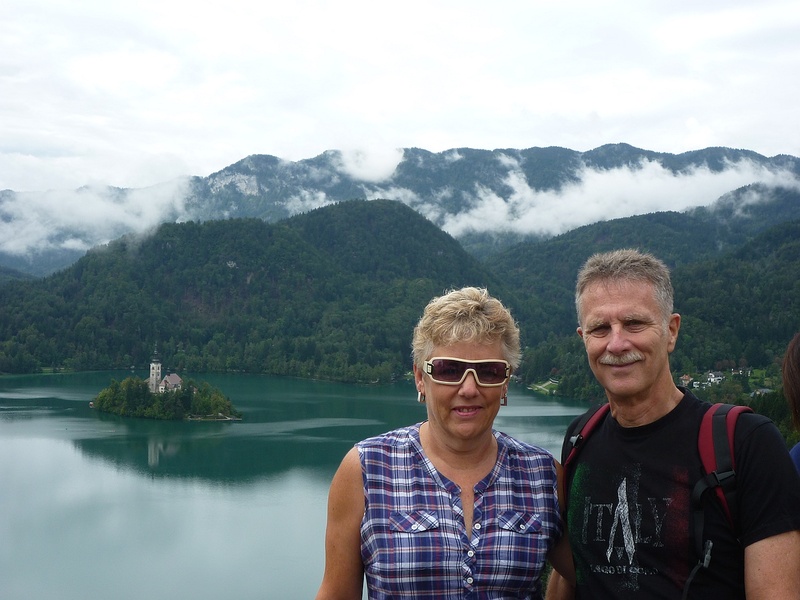 On our second tour, we were all energetic enough that when offered a choice of a hike through Vintgar Gorge, or a boat ride to the Church of the Assumption on Bled Island, we opted for both – an excellent choice as it turned out. While the highlight of this day was a visit to Lake Bled with its hilltop castle and island church, the stops at the glacial lake of Bohinj and the medieval town of Skofja Loka were equally as interesting. Throughout both days, our personable guides were able to keep answering our questions and providing us with interesting historical detail. A sacred site since prehistoric times, the famous Church on Bled Island recently hosted its first gay marriage. 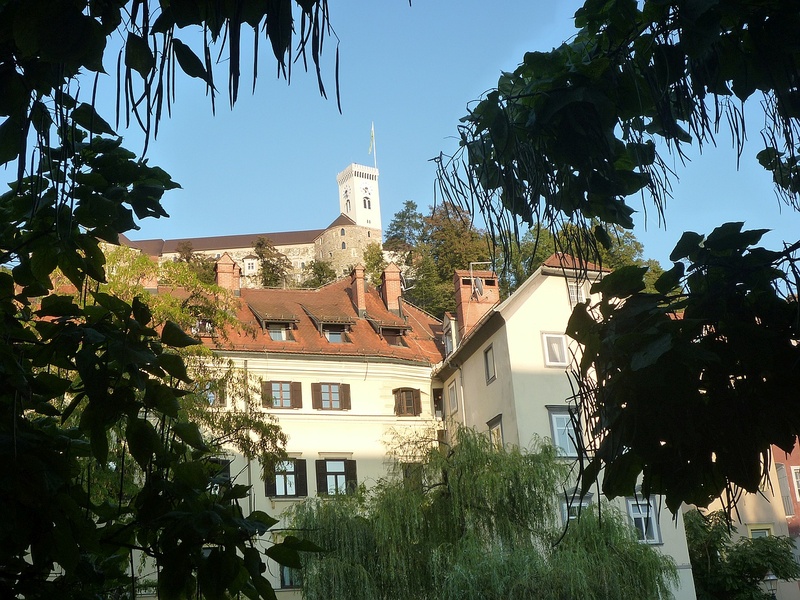 We enjoyed the pace of life in Ljubljana, and could easily have made a longer visit of it. Given its small size, so many of its attractions were within walking distance of our apartment on Mestni trg. We enjoyed walking down streets at random, and checking out anything that looked interesting. Returning from Tivoli Park one morning, we stopped at an open-air café near the Narodna galerija. A sign advertising evening jazz had us return after dinner for a drink and a little sax by candlelight. If you want to know where it is, we can’t help you. The place is only open in the summer, and had recently moved. Next year it may be somewhere else. So you’ll just have to go wandering and see what you find. 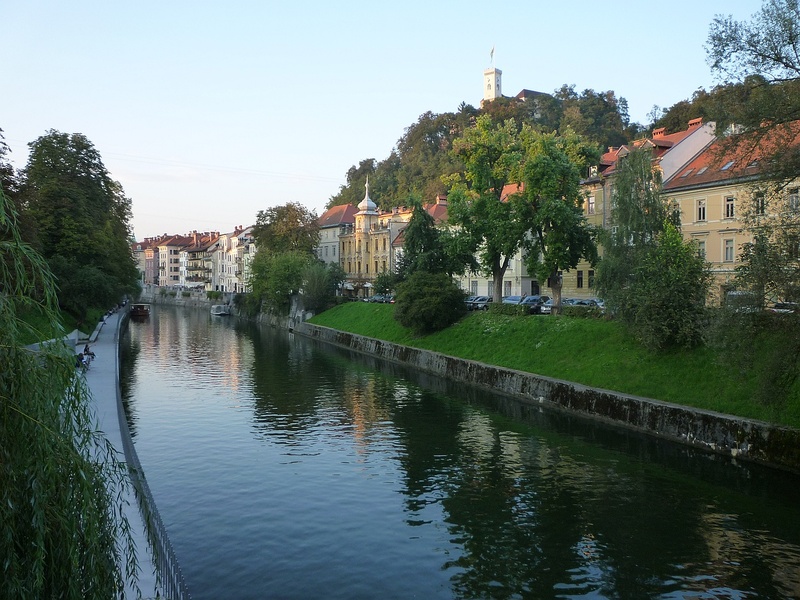 The Ljubljanica River near our apartment in the old town with the Castle above. 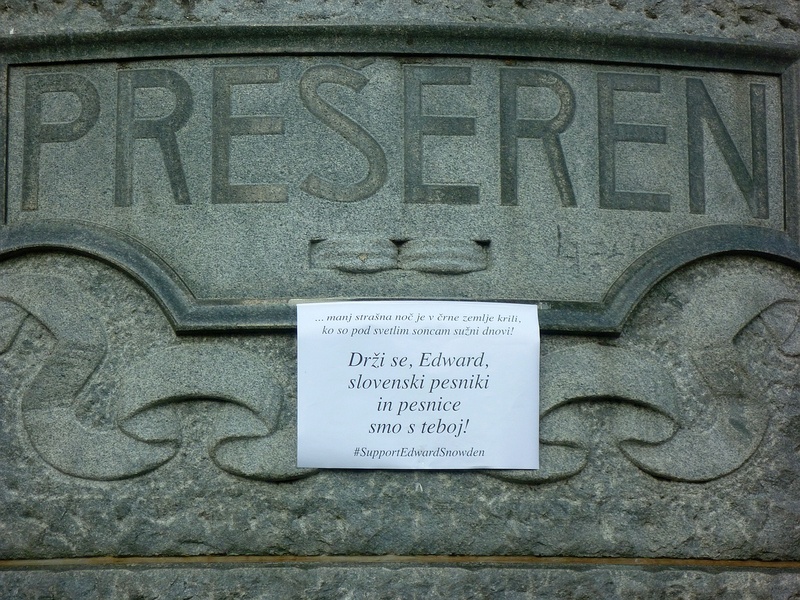 This entry was posted in Travel and tagged AirBnB, Dragon Bridge, Edward Snowden, Emona, Lake Bled, Ljubljana, Ljubljanski grad, Postojna Cave, Predjama Castle, Prešeren, Roundabout, Slovenia, Slow Travel, Tours on March 1, 2015 by "No Pension, Will Travel!" with Cheryl + Paul. Wow!! What a find. It sounds like you had a fabulous time. Love the pictures. Yes, it was definitely a delight for the eyes — it was hard to pick only a handful of photos to go with the text. A nice place to do some slow travel, linger over a kava, and sip some jazz. And, if I recall, there were good flights from Spain at various times of the year. Fills me with wanderlust, Paul! Have you thought about professional travel writing? The Boomer Abroad sort of thing? Contact The Sun immediately! Awesome post and the photos are top notch. You have a way of describing things beautifully. I agree with another of your commenters that you may have a future in the travel industry. Thanks, Iva, we will return some day, and will definitely look you up. The Triple bridge is work of the most famous Slovenian architect Joze Plecnik. Please, correct that mistake. It is pretty offensive. Thank you. My apologies for the error in my reading of the bridge’s history. I have supplied what I hope is a more accurate account. Thanks for the correction. We enjoyed the work of Jože Plečnik as we walked around the city. Hey guys – We’ll be in Ljubljana in just over a month. Wondering if you have a link to Sara’s Airbnb apartment? If so we may be interested in renting for the 2 or 3 days we are there. Feel free to write me personally if you don’t want to share here.